I wasn’t sure what to expect when I toed the start line for the 50-km race at The North Face Ultra Trail Challenge on Easter Sunday. For a month before the race, I stressed out about running in the dark, staying awake during the race, whether doing the race will actually aggravate my shin splints and whether or not I should run with sticks. It didn’t help that I’d been suffering from allergies brought on by torrents of Beijing’s willow catnips and dust and I was on a daily diet of antihistamines, which kept me in a groggy state most of the time, despite sleeping 8-9 hours every night. My long outdoor training runs were cut short by fits of coughing and sniffles. The evening of the race, I met up S for a pizza dinner, our final carb loading before the race. We then met up with three other acquaintances who were also doing the race at the metro station and took the organiser’s shuttle to the race venue. After an hour or so of prepping, checking and taking a couple of selfies, we took our spot at the start line and began doing warm-up exercises to the loud, pumping pop music and the shouts of the Chinese hosts. The music and warm-up exercises did little to stifle my yawning, and I wondered how I was going to stay awake for the next ten hours of so. As it turned out, my worries were unfounded. Once Cinderella hour struck and I began shuffling forwards with 1700 other runners, I stopped yawning and was wide awake. It was probably the excitement of doing my first night trail run mixed with the fear of losing my way that fueled my sudden burst of energy. I faced my first unexpected challenge after running for more than 10 km. I was caught in the middle pack at a narrow uphill climb, and couldn’t continue climbing at my own pace. It was stop-start for at least 30 minutes and I caught a chill when I reached the top of the hill. I suddenly felt a desperate need to use a toilet but was told there wasn’t one for at least another 8 km. I was on a narrow part of the route and it was impossible to relieve myself in the bushes without being seen by other runners. After taking a painkiller to relieve the cramps, I pushed on for another 3-4 km until I was too much in pain to continue. At this point, the volunteers directed me to the nearby bushes off the designated race route to do whatever I had to do. I’d never felt so relieved (pun intended) as I did at that time. After this slightly embarrassing and traumatic episode, I wasn’t sure if I felt up to running the remaining 35 km, yet it was too cold to stay still. So I decided to continue running until the next checkpoint where there’d be sweeper vans then make an assessment if I was physically able to keep going. I kept plugging on until I got to the 30-km mark, where I bumped into T. I was surprised to see him there as I was convinced he’d be at the front of the pack with the rest of my friends, as he’s a sub-4:00 marathoner. He told me his tank completely ran out when he got to this checkpoint and he’d been resting for the last hour or so. He admitted he hadn’t trained on trails at all and road running fitness was no guarantee of doing well on a trail run with significant elevation (we’d done 1500m out of 2300m). We discussed if we should both call it a day and just get on the next sweeper van, then decided to give it a go until the next checkpoint at the 42-km mark. After we started running, it was obvious T had gotten his steam back, and I told him to go ahead and I’ll try to catch up. I never managed to catch up with T as my own steam ran out at around 40 km. I’d scrambled and clawed up Haohanpo for about half an hour, then concentrated hard navigating a long and tricky descent. I basically walked the remaining 7 km to the finish line. The finish line never felt so far away in my life. I was famished but couldn’t stomach any food. My hands were swollen from water retention and yet I was still thirsty but there was nothing left in my bladder. I’m happy to say I completed my first 50-km ultra in 11:32:16. It took me quite a bit longer than I’d anticipated and nothing I was worried about actually happened. But considering the circumstances, I was surprised I even managed to finish the race. An experienced ultra runner (who finished in 7:48) advised me to take the race in chunks of 10 km and not stress about pace. It was her advice that kept playing in my mind when I felt like I couldn’t go on. It reminded me to never underestimate the power our words have on others. For the first time after I started doing races, I actually swore I’m not doing another ultra for the rest of the year, and have not registered for another ultra to date. Memories of the pain and discomfort of the North Face trail challenge remained with me for two weeks until I fell off my bike on a descent and acquired fresh scrapes, bumps and bruises. That’s fodder for my next post. Most of April has passed me by in a blur, mostly with work travel, first to Hong Kong then to Washington DC. Incidentally the DC trip was on the weekend I’d registered to the Beijing Run. I was very disappointed that I couldn’t take part in the race as I’d been training for it. On top of that, I came down with a serious cold after getting back from Hong Kong and couldn’t speak for a couple of days before my flight to DC. The day before my flight, I was so sick I could only get out of bed to cough, take medication and drink water. I could barely swallow any food. It was a miracle how I managed to catch my flight the next day. To say that week was the most miserable I’ve felt since breaking my arm would’ve been a gross understatement. Purely by the grace of God, my throat miraculously healed on the flight, so much so that I could swallow the (disgusting) meals served on the plane. By the time I landed in DC, I’d regained some energy and people could actually hear what I said. I even felt well enough to sit through dinner at Morten’s The Steakhouse with my colleagues. Despite sleeping at a relatively decent hour, I was wide awake by 5:30 am the next morning. I contemplated my options for whiling away the early morning hours without waking up my colleague, and decided I’ll go for a short run outside to check out the surroundings. This being my second time in DC, I had some inkling of my bearings, having researched the hotel I was staying at and weather forecast for the weekend. It was so cold when I stepped outside of the hotel, I decided to start jogging immediately, instead of walking briskly, to warm up. From my first trip to DC, I’d noticed there’s a real love for running in this city. So it didn’t surprise me to see other runners out and about on my run. Being a relatively new runner myself, seeing the locals running gave me the extra motivation to run on that very cold Saturday morning, even though I wasn’t feeling 100%. Running in an unfamiliar city is always a little challenging for me. In DC, I stopped to look at signs, made detours when confronted with road blocks near the White House, and generally accepted whatever terrain I literally ran into. I enjoyed the sense of adventure, not knowing what I’d see as I turned a corner and getting a little lost and using the GPS on my phone to find my way back to the hotel. It wasn’t a particularly strenuous or long workout, but it was definitely memorable. There’s nothing quite like watching the sun rise behind the Lincoln Memorial and seeing the most famous capital city of the world slowly wake up on a beautiful spring morning. I wasn’t sure if it was such a good idea to go jogging when I was still recovering from the cold but surprisingly I felt much better after the run. I’d tested the limits of my body and learnt that it was capable of much more than I thought was possible. It gave me the guts to cycle, swim and run after I got back to Beijing and was suffering from hayfever symptoms as a result of my allergic reaction to willow catkins. I had to take Zyrtec a couple of days just so I didn’t rub my nose raw but otherwise I’ve felt better each time after I rode, swam and ran. Last night when I was doing laps in the pool, I began contemplating the reasons behind my recent addiction to exercise. My friends have been asking me how I maintain my motivation to exercise everyday. I realised apart from training towards the races I’ve signed up to do, I was just very grateful for every single day my body allows me to run, swim and ride, and I want to enjoy every bit of it while I can. 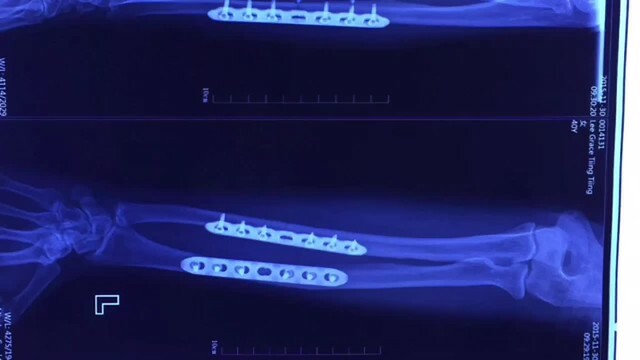 It’s been three months since I underwent an operation to have two titanium plates inserted into my left forearm. I’ve recovered so well that most of my friends and colleagues have almost forgotten that I broke my arm until they see the scars. And even then, they’re surprised at how well my scars have healed. I’ve never heard of scar management until my physiotherapist told me about it after I had my stitches removed two weeks after the operation. I must admit I wasn’t sold on the idea immediately, thinking my physio was doing a sales pitch so he could make extra consultation fees off me. It took me less than 24 hours to realise I do need that scar management consult. I woke up the next morning with a sore and stiff left arm which could only be relieved by applying adhesive heat packs. The tissue surrounding my scars felt hard and inflexible, and this sensation didn’t improve over time. After doing some research online, I picked up the phone and made an appointment to see my physio that Saturday. He suggested placing a hot water bottle that wraps around my forearm for 10 to 15 minutes, making sure there was a layer of clothing between the hot water bottle and my arm, so I don’t burn my skin. Using my right thumb, massage in strokes perpendicular to the direction of the scars. Using my right thumb, massage in small circular motions along the scars and the surrounding scar tissue. This last massage required two hands which meant someone else had to administer it: starting with the wrist, hold my left arm with one hand and with the thumb of the other hand, push the soft tissue along my scar. Living on my own, I’ve only been able to do the first two massages everyday since the consult, but they’ve provided much relief to the scars along my left forearm, particularly in the cold winter months. To date, I’m quite happy with how my scars have lightened in colour and texture. People who saw my scars a month ago were surprised when I told them how recent my operation was. Apparently Dermatix works best on recent scars but will reduce the appearance of old scars as well, just to a lesser extent.